Already a frost? My, my! This photo is structured so well--the frosty ground spreads out so nicely with the poufy sheep walking through it. And DDD in the corner of the pic is a nice touch. It's amazing what you manage to capture with your camera, FG, as busy as you stay all day long! Beautiful photo. It's hard to believe it's so frosty already. We had frost on the rooftops two days ago, and we live at the ocean! They are nice and toasty in their wooly sweaters!!! wow... it's hot like spring here today in DC! 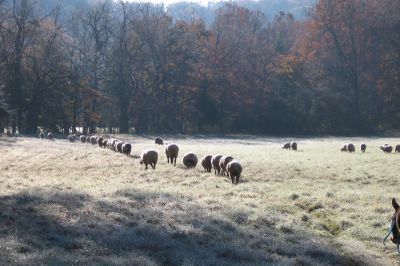 Would it be weird that those furry rumps trundling through the frost made me laugh out loud? Cuz they did. And I'm not ashamed. Cute sheeps. We have snow on the ground. I absolutely love your photographs. I find them inspiring.I'm getting out my coloured pencils right now, because scrolling down at all your previous photos makes me want to draw and paint so much! Thank you! I just wanted to send you a quick note and THANK you sooooo very much for the sweet note and the donations:) As soon as I get a moment I will link you to my blog. Your blog is sooo neat as soon as I have a moment I'm going take some time and go thru your links. Blessings and Light to you..
Sheep again, I just love your sheep photographs. This one would make a great Christmas card. Oh my, that could be framed and win a blue ribbon at the local 4-h fair....being a country girl mysel. How could you not be inspired ? Good thing those cuties have their thick wool coats on! What a beautiful sight, it feeds my soul. I can feel the nip in the air! Oh we've had quite a few frosty mornings in the low 20sF already--including some several days before our "official" frost date of October 15th. This morning was the coldest morning yet--it dipped down into the teens. Brrrr. But it's sunny and around 50 during the day which is just the kind of weather I love. So glad I've inspired you to pull out your pencils and create some art! While I am flattered that you like my photos so much, the fact is that all of my photos are my own original works of art. They are copyright by me and belong to me. With that in mind, I ask that you (and anyone else) please not copy and use my photos on blogs/websites or in any other manner. If someone would like to post a specific photo of mine on their blog/website for a specific reason, please email me for consent: farmgirlfare AT gmail DOT com. Thank you for your understanding and for complying with my request. Hi farmgirl. I appreciate you lettingme know what I need to do if I or anyone wants to use your pics. I'm not the type of person to take someones work.. Thank you for getting back to me.. I think I will admire them from afar..